Fold your Sleeves… Get Ready… It’s 7-8-9 February!!! We take this opportunity to thank you all for sponsoring the 26th cricket tournament in Dec – 2012. It would have been difficult without all your support and patronage. 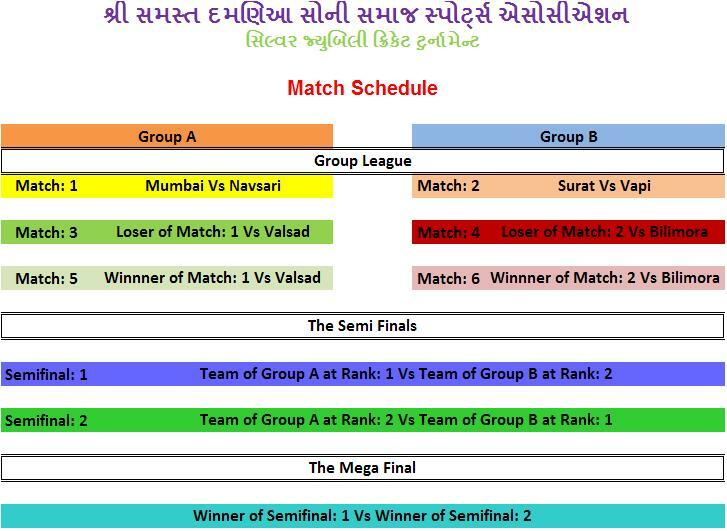 Maheshbhai, Nikunjbhai & Atulbhai your initiatives have played a key role in keeping the tournament alive. We are indebted to you all that you have sponsored the BDCA Stadium for five years. We also extend our deep sense of gratitude to Shri Chandravadanbhai Ishvarlal Parekh & Shri Hiten Chandravadanbhai Parekh for sponsoring Champions Trophy “CIP Silver Cup” for five years. This was the second year. Heartily thanks to the family of Late Shri Gopaldas Nagindas Parekh & Late Kusumben Gopaldas Parekh, Vapi for sponsoring the Runners up trophy “Mahek Cup” for five years. The trophy has been named from their loving granddaughter’s name – Mahek. This was the second year. Our thanks also go to Shri Navnitbhai Nathalal Parekh family, Ahmedabad for sponsoring the prizes in the memory of Late Shri. Prashant Navnitbhai Parekh, for Man of the Series, Man of the Matches, Best Batsman, Best Bowler, Best Fielder & Best Wicketkeeper. 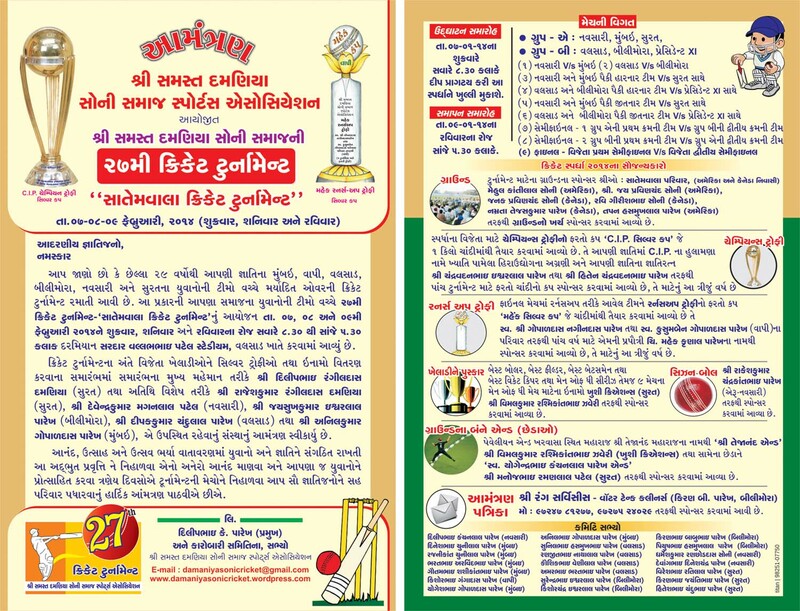 We thank Shri Pritesh & Shri Ranjitbhai M Parekh, Surat for sponsoring cricket match balls for the tournament. Last but not the least; we thank Hemrashmi Parivar for sponsoring both the ends of the BDCA ground. The ends had been named as “Shri Tejanand End” & “Hemrashmi End”. We feel indebted that you have sponsored the same for last five years. We are glad to announce that the association has received the sponsorship of BDCA stadium, Valsad for the next four years also! For the year 2013, the stadium has been sponsored by the extended families of Late Shri Jekisandas Jivendas Soni, Navsari (Satemwala) Families of the USA & Canada. For the year 2014, the stadium has been sponsored by Late Shri Ishvarlal Motiram Choksi family, Surat. For the year 2015, the stadium has been sponsored by Mehul Dilipbhai Parekh & Ankur Dilipbhai Parekh, now Surat. For the year 2016, the stadium has been sponsored by the extended families of Late Smt. Kashiben & Chhaganlal Soni, Navsari (Premanandwala). For 2013, cricket balls have been sponsored by Shri Rakesh Chandrakant Parekh, Navsari. For 2013, trophies for Man of the series, Man of the Matches, Best Batsman, Best Bowler, Best Fielder & Best Wicketkeeper have been sponsored by Shri Vimalkumar Rashmikant Zaveri, Surat of Khushi Diamond. For 2014 & 2015, cricket balls have been sponsored by Shri Dharmesh Ranchhoddas Soni, Surat & Shri Rakesh Kishorbhai Soni, Navsari. Starting from 2013, one of the cricket ground ends (Pavilion End) have been sponsored by Shri Vimalkumar Rashmikant Zaveri, Surat of Khushi Diamond for five years. The end has been named as “Tejanand End” in the pious memory of Shri Tejanand Maharaj of Kharvasa, Surat. Another end has been sponsored by Shri Manoj Ramanlal Patel, Surat for five year starting from 2013. The end has been named as “Yogendrabhai End” in the loving memory of Late Shri Yogendrabhai Kanchanlal Parekh, Surat. Hope to see you all during the forthcoming years and be a part of it. Once again, on behalf of all committee members of the association, I sincerely thank you all.